The Baroness: Would you look at that? Real American heroes. I’m not American but the G.I. Joe’s were certainly heroes of mine when I was a young boy. After the financial success of the TRANSFORMERS movies, it was pretty clear that a G.I. Joe movie could not have been far behind. That said, after the Transformers of my childhood were so butchered and chopped up into easily chewable bits, I wrote off any hopes that the G.I. Joe franchise would be any better. I gave up entirely when I heard that Stephen Sommers, director of THE MUMMY, was going to helm. But here we are, finally facing the release of G.I. 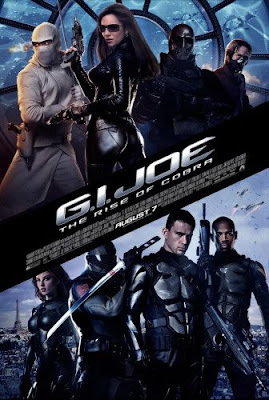 JOE: THE RISE OF COBRA and I find myself not surprisingly repulsed by the return of G.I. Joe. Instead, I find myself oddly enjoying myself. It is completely mindless but it is constant action that is as explosive as it is loud. With the barrage of noise and fresh visuals coming at you non-stop, it’s hard to notice, let alone care, that there isn’t very much depth. G.I. JOE could easily be just another terrorist flick and, on many levels, it still is. What it needs to differentiate itself is personality. The characters really have to pop and impress with their special talents in order to become memorable and relevant. For the most part, the cast – from Channing Tatum as the new guy with a lot of promise, Duke, to Sienna Miller, as the bad girl with a penchant for hot shoes, The Baroness – does their part. There isn’t much being asked of them past owning their confidence and playing their lines as smoothly as possible but coming off cool is half the battle here. These are the elite after all; I would expect nothing less of them than being constantly on top of their games and not fussing their hair while they’re in direct combat with each other. It having been some time since I actually last saw an episode of the cartoon this film is based on, I can’t say that I recall all of the interpersonal relationships that lay the foundation of dramatic tension for the film (Duke and The Baroness used to be engaged?) but with as many as there are, the sequels, and there will be sequels, have plenty to play with. Not all of the characters stand out and lead me to wonder why they bothered writing in these particular characters out of the dozens of possibilities if they intended to do nothing with them. Still, it isn’t just about character; there are also plenty of toys to play with. G.I. JOE is definitely not short on cutting edge visuals. While none of them are particularly earth shattering, what there is, there is plenty of. The coolest of the crowd and the central piece of artillery in the film are the nanomytes. These mechanical insects can invade a human body and eat disease but they can also eat through whole cities unless a killswitch is pulled to call them off. The Joes and their mortal enemies, Cobra, duke it out (HA!) for possession of these little buggers and their efforts take them all over the globe, from the Sahara desert to the polar ice caps to midtown Paris and Washington and they do it all in style. G.I. JOE: THE RISE OF COBRA never elevates past its conventional construction to feel truly like the birth of an exciting new franchise but Cobra’s rise is definitely a daunting one and they prove that they are not to be toyed with. Sure, there’s a prerequisite training sequence set to the song, “Bang a Gong” and a completely useless cameo appearance by Brandon Fraser but the action itself more than makes up for any of this. It passes the summer junk bar by enough to be good late summer fare. And after all, G.I. JOE is a summer blockbuster above all else so what more is there to hope for. So, now you know all there is to know about G.I. JOE: THE RISE OF COBRA and we all know what knowing is, don’t we? I am not the least bit surprised by the box office numbers here and I think the actors did a fine job with what they were provided. Their job in a movie like this is to make bad dialogue seem appropriate and to look pretty. Sure, they can do so much more but that is rare. I can only say that I had a decent time watching this film and as far as a film based on a toy franchise goes, it was pretty solid.